1. Chatbot roBot - a unique bot, since learning is allowed for everybody. But the knowledge base is moderated. In case of uncensored language, senseless answers, insults, advertising, etc., the authors of these answers will be blocked, and their names removed from the table of authors. Interesting, funny and kind answers, on the contrary, will be transferred to the main knowledge base and have priority when choosing the appropriate answer. Funny and witty answers will be published in the VKontakte group. 2. Near each answer, there are voting buttons for the answer. This is an important part of learning. If you get a rough or abusive answer - press a negative voice. 3. If you get answer from a bot that you liked, then do not hesitate to press a positive voice. Answers that have more positive votes will become part of the basic knowledge base. And their authors will always go down in the history of the bot. Of course, you can not vote for your answers. 4. If the bot answered incorrectly or does not know the answer at all, then you can train its response in this situation. And here it is important not only to formulate the question to the bot, but also the context in which it is asked. Try to give a full answer. 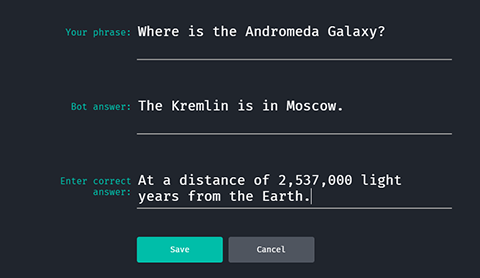 In this case, the answer would be better to write completely: "The Andromeda Galaxy is located at a distance of 2,537,000 light years from the Earth". 5. 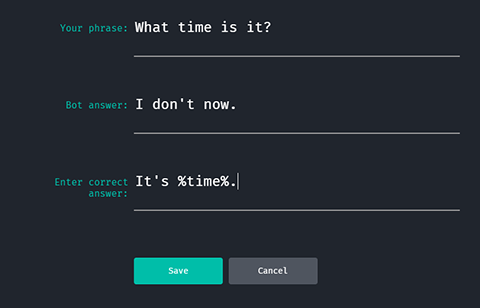 When creating a new answer, you can use special commands for the bot. For example, for the question "What time is it now?" you can specify the answer% time%. When the bot sees this command, it automatically sets the time it sees on its server clock. Here are some more popular commands. %botname% - to insert the name of the bot. %username% - insert user name. %tell_joke% - the bot will replace this with one of its jokes. New jokes and jokes can be sent to the VKontakte group. %tell_interesting% - the bot will replace this with one of the interesting facts that it knows. Send new proposals to the VKontakte group. %time% - insert the current time according to the bot clock. %date% - insert the current date on the bot calendar. %weekday% - insety the current day of the week. %ask% - the bot will insert one of its questions. This is usefull to change the topic of the dialogue or involve the user in the dialogue.